Ronald Stevens of Houston, TX speaks about his life and recovery from addiction at the “Fighting Addiction Together” invitational luncheon. Mr. Stevens, with the help of a substance abuse rehabilitation center, overcame his addiction issues to lead a healthy and positive lifestyle today. On March 19, 2015, locally and nationally recognized pastors, ministers and bishops, civic leaders and law enforcement officials gathered in the Hall of Legends at Ford Field, home of the Detroit Lions, for an informal luncheon and educational presentation called “Fighting Addiction Together”. 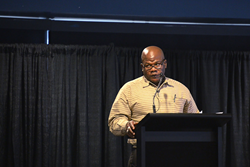 Hosted by LiveToBeSober.org and led by former Lions wide receiver and motivational speaker Herman Moore, the “Fighting Addiction Together” event focused on informing those present about different options in substance abuse treatment in the new landscape of healthcare insurance coverage that has surfaced since the implementation of the Affordable Healthcare Act. Several guest speakers were invited to this luncheon, including a gentleman from Houston, TX, named Ronald Stevens. Mr. Stevens, with the help of a substance abuse rehabilitation center, overcame his addiction issues to lead a healthy and positive lifestyle today. He was more than happy to come to the “Fighting Addiction Together” event to share a little about his journey from addiction to recovery with the audience. A video of his speech was recently released on LiveToBeSober.org’s YouTube channel. Other guest speakers at the “Fighting Addiction Together” luncheon included Bishop William Murphy and Detroit Police Assistant Chief of Police Steve Dolunt. Guests also received gift bags with educational brochures, DVDs, Parent-Child promissory notes regarding abstinence from substance abuse, home drug tests and other tools that are helpful in giving guidance to those who may be struggling with addiction. A raffle for executive suite seats for a Detroit Lions home game was also held.